Doesn’t this look like an adventuring party you’d like to be part of? Stat one of these characters up using the Adventurer Conqueror King System and you can play ’em in a session I’ll run via G+ hangout! 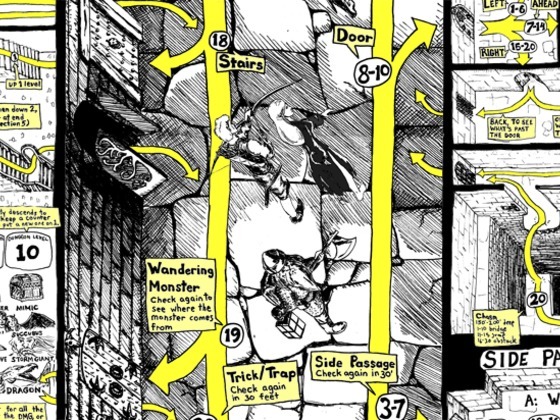 Plus, if the Kickstarter for Paul Hughes’ Random Dungeon Generator as a Dungeon Map poster succeeds in raising more funding than Autarch’s Player’s Companion did, the backers of that worthy project will get to admire your character-making handiwork as part of a bonus goal I offered Paul in the foolhardy belief that it’d never happen. (It is now less than $300 short). Here’s the backstory. The designers of 3rd Edition D&D went to remarkable lengths to reference 1st Edition AD&D. This is something I’ve been saying for a long time, but the more I learn about 1E the more examples I discover. At Gary Con, we were talking about things we liked and didn’t like about 3E. Iconic characters made it onto both lists. Plus: The way that the same heroes would turn up in different contexts created the sense of the books being a window into another world, the way that elements of the Cthulu Mythos like the Necronomicon showing up in different stories made it seem real (and a precursor of roleplaying games and transmedia). Minus: We weren’t convinced that the 3E iconic characters emerged from actual play; their inception had the whiff of a clever memo from WotC’s marketing department. Given that I care about things like illustrations reflecting actual play, let’s make sure that the ACKS writeup of the AD&D iconics reflects characters that a player created (albeit to match a pre-existing visual image) and played in a game! Reply in the comments to claim which of these five adventurers you’d like to stat up and play, I’ll email you to work out the details and schedule the G+ hangout. 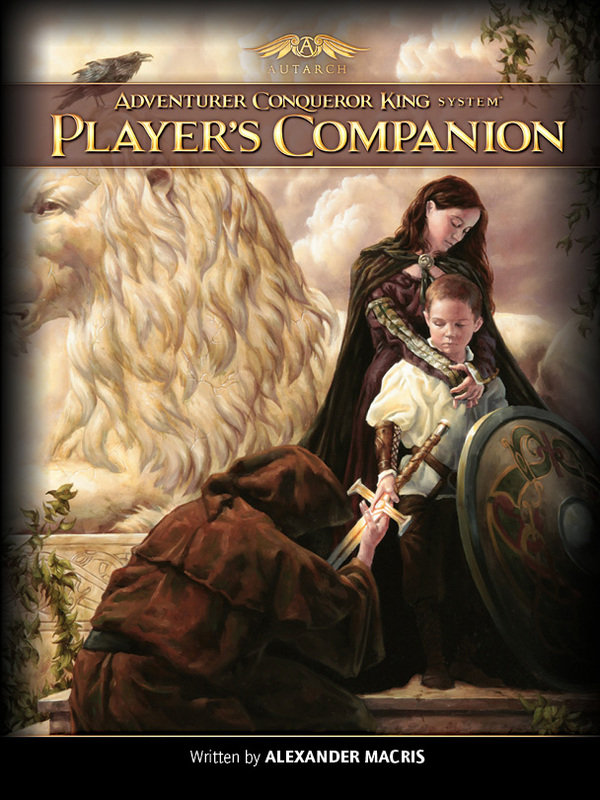 Cover for the Adventurer Conqueror King System Player's Companion. Art by Michael C. Hayes, design by Carrie Keymel. The Kickstarter for the Player’s Companion ends today, Friday March 16th at 10 pm EDT. After Autarch’s crowdfunding campaign for the Adventurer Conqueror King System wrapped up, we often got comments from people saying they wished they had known about it while the Kickstarter was still going. I hope that this announcement can help save people from a repeat of this terrible fate! It’s worth noting that, if you haven’t picked up ACKS yet, by backing the Player’s Companion backer you can choose rewards that’ll get you both the core system and its first expansion. Two Sought Adventure gets you both books in PDF, each of which has a coupon that’ll give you a discount on a future upgrade to its hardcover equal to the price you paid for the electronic copy. Pair of Kings gets you ACKS in hardback + PDF and the Player’s Companion limited edition softcover pre-release, shipping together as soon as they’re available (weeks before they’re in stores), after which you’ll get the final Player’s Companion in hardback + PDF once it completes its final development based on feedback and playtest reports from backers. You can also add to your Player’s Companion pledge to get various other combinations of ACKS and its new expansion, including using the coupon in the ACKS PDF you may already have for a hardback upgrade. Email support@autarch.co if you have questions about how to do this! Yes, you may say, but what is this Player’s Companion of which you speak? Good question! It’s an expansion for the widely acclaimed Adventurer Conqueror King System, designed to give players new tools for creating the kinds of characters they want to see in their campaigns. Because ACKS builds directly on the legacy of the original fantasy roleplaying game, the material in the Player’s Companion will also be useful to groups playing other variants of that lineage. 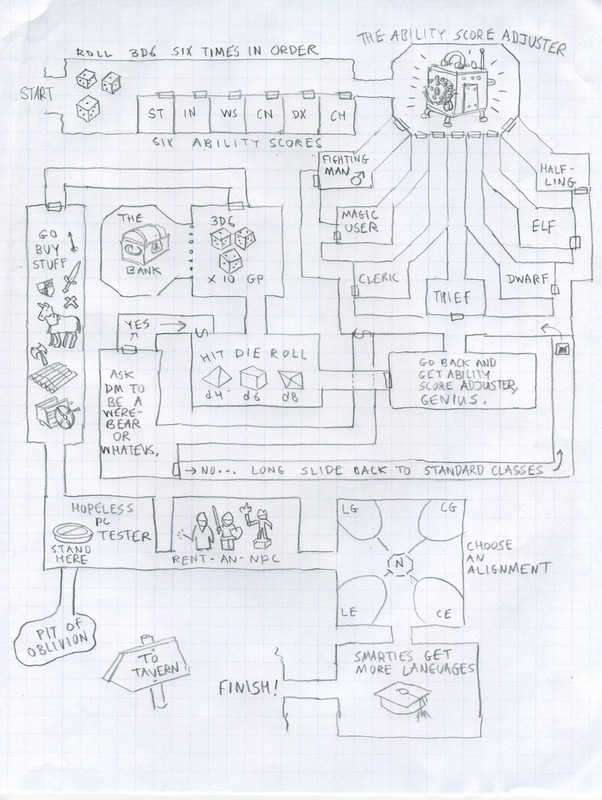 No conversion should be necessary to use the Player’s Companion with Moldvay/Cook’s original B/X and its inheritors Labyrinth Lord and Basic Fantasy, and adapting the material to other TSR-era editions and their retro-clones will likely present no problems to those hip to the essential similarities between all OSR systems. Here is what is in the pre-release version of the Player’s Companion that we will have at Gary Con IV. Thanks to the backers who helped us reach the first three bonus goals and thus enabled this list of contents to be much more expansive than originally planned! 16 new character classes to expand your campaigns, including the anti-paladin, barbarian, dwarven fury, dwarven machinist, dwarven delver, elven courtier, elven enchanter, elven ranger, gnomish trickster, mystic, paladin, shaman, Thrassian gladiator, warlock, witch, and Zaharan ruinguard. 238 character generation templates with pre-selected proficiencies, spells, and equipment options to create archetypes such as the Aristocrat Bard, Buccaneer Thief, Gladiator Fighter, or Runecaster Shaman. A point-based customized class system that lets you create the perfect blend of fighting, thievery, divine, and magical power. The custom class creation rules are 100% backwards compatible with every class in the ACKS core rules and all of the classes in the Player’s Companion. The final edition will have still more content, including guidelines for creating new spells through magical research and a system for side effects from experimentation we’re developing using Gygaxian democracy. Perhaps the most exciting thing about the Player’s Companion is the explosion of player-created content it’s heralded, either because it gives many tools for custom creation to the user, or simply because it coincides with the ACKS PDF having been out there long enough for people to start sinking their teeth into it. Every game designer wants to know that their stuff is being played with, so it’s really gratifying to watch this happening. Check out the Autarch forums for a sense of the creative ferment that’s out there! These humanoid reptiles dwell at the border of land and water—swamps, rivers, along the coast—where they can keep their scales damp and hunt for fish and amphibian prey. Though most are semi-intelligent at best, some are fully as intelligent as any human. Whether these are a new breed or an atavistic strain is unknown. While these ‘smart’ lizardmen tend to gather into tribes of their own ilk, some prefer to go forth on land to travel among civilized folk. The prime requisites for a lizard man are Strength and Constitution. A lizard man character whose Strength or Constitution score is 13 or higher will receive a 5% bonus on earned experience. Lizard men whose Strength and Constitution scores are 13 or higher will receive a 10% bonus to earned experience. RESTRICTIONS: Lizard men use eight-sided dice (d8) to determine their hit points. They may advance to a maximum of 8th level of experience. Lizard men may wield any melee or thrown weapon, but they have no training in projectile weapons like bows and crossbows. Their scaly hides grant them a base AC of 5, but they may not wear armor or use shields. Due to their aquatic nature, they must immerse themselves in water for at least one hour per day. Failure to do so results in 1d6 damage per day. They also suffer 1d6 damage each day they spend in cold or dry environments such as snowfields or deserts. Lizard men must have a minimum score of 9 in Strength and Constitution. SPECIAL ABILITIES: Lizard men may attack with their fangs or claws; such an attack inflicts 1d6 points of damage on a successful attack. They are difficult to spot in verdant environments, blending in seamlessly with forest foliage, swamp growth and seaweed. They have only a 1 in 6 chance of being detected in this kind of cover. They can also hold their breath underwater for 1 turn/level. All lizard men speak Common, Lizard Man and the alignment language or dialect of the character. ADVANCEMENT: As per the fighter advancement table. These dwarfish subterranean dog-people are renowned for their cowardice, preferring to defend their lairs with sadistic traps than to risk their lives in battle. Nonetheless, some choose the path of adventure, whether from overweening greed, an unsatisfied bloodthirsty streak or some unkoboldish vein of courage. Their hairless, scaly red-brown hides blend in with the dirt and stone of their lairs; only the dull red glow of their eyes gives them away. The prime requisite for a kobold is Dexterity. A kobold character whose Dexterity score is 13 or higher will receive a bonus on earned experience. RESTRICTIONS: Kobolds use four-sided dice (d4) to determine their hit points. They may advance to a maximum of 4th level of experience. Kobolds may use any type of weapon that has been “cut down” to their size. Thus, they cannot use a two-handed sword or long bow, but may use a sword or short bow. They may wear nothing more protective than leather armor, and cannot use a shield. Kobolds must have a minimum score of 9 in Dexterity. SPECIAL ABILITIES: Kobolds live in underground caverns and warrens, and have infravision (heat-sensing sight) which allows them to see 60 feet in the dark. A kobold’s sneaky nature and tricksy upbringing allows it to open locks, find and remove traps, climb walls, move silently, hide in shadows, pick pockets and hear noise as a thief. Due to their small size and skill at dodging, kobolds have a bonus of -2 to their Armor Class when being attacked by creatures larger than man-sized. All kobolds speak Common, Kobold and the alignment language or dialect of the character, plus the languages of goblins and orcs. ADVANCEMENT: As per the thief advancement table. While these half-human, half-horse hybrids are known to dwell in sylvan settings apart from men, some few seek out the pleasures and wonders of civilization. Some have been cast out by their herds for unsavory practices; others find that their desires cannot be fulfilled in the stultifying presence of their brethren. In any setting, centaurs enjoy carousing and bibulous overindulgence, often to the detriment of those around them. The prime requisite for a centaur is Constitution. A centaur character whose Constitution score is 13 or higher will receive a bonus on earned experience. RESTRICTIONS: Centaurs use eight-sided dice (d8) to determine their hit points. They may advance to a maximum of 8th level of experience. Centaurs may use any type of weapon or shield, but they may not wear armor. Due to their large size and unwieldy equine bodies, they have difficulty turning around in enclosed spaces; they cannot climb ladders or ropes, nor can they enter small openings. SPECIAL ABILITIES: Being half-horse, a centaur has twice the base movement rate and carrying capacity as a normal man. Centaurs may attack with their hooves instead of with a weapon; a successful hit inflicts 1d6 points of damage. Starting at 4th level, a centaur may make 2 attacks/round, one with a weapon and one with its hooves.